Cluster shown in standard measure – metric clusters similar. B. Information display. See Information displays for more information. 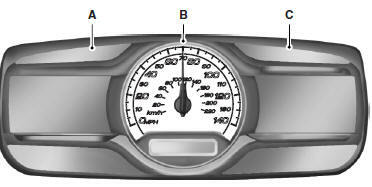 Indicates approximately how much fuel is left in the fuel tank (when the ignition is on). The fuel gauge may vary slightly when the vehicle is in motion or on a grade. The fuel icon and arrow indicates which side of the vehicle the fuel filler door is located. A. Left information display. See Information displays for more information. C. Right information display. See MyFord Touch™ for more information.